The meeting of the courts of Mistick Krewe of Comus and King of Carnival Rex has happened, http://www.theadvocate.com/new_orleans/entertainment_life/article_f64c931e-06de-11e8-a7dc-3bae2229f574.html, the streets have been cleared, and cleanup has begun. Mardi Gras is officially over and now the Lenten Season begins. Here in South Louisiana, the Lenten Season brings family and friends together on many of the weekends for crawfish boils as seafood is a traditional substitute for meat on Friday’s. We take this time of religious reflection to gather and celebrate our relationships and as always, show our love with food. At the end of February, crab season begins. 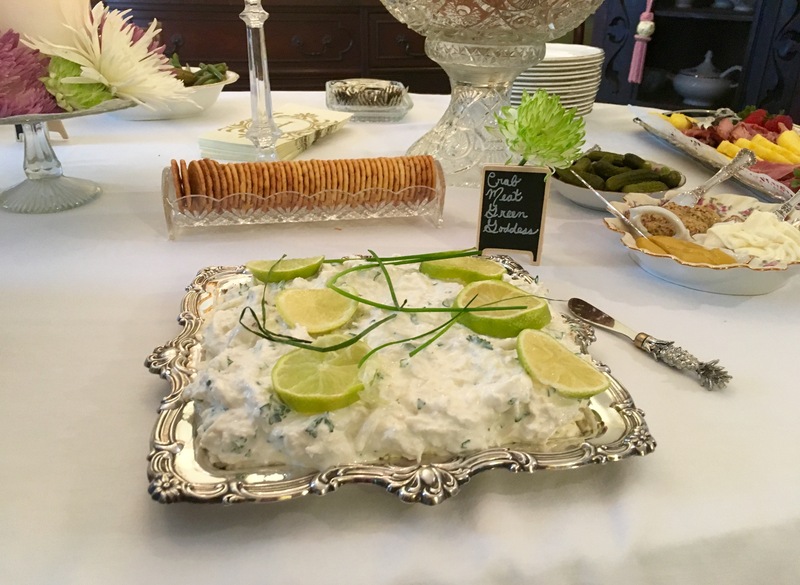 Crabmeat Green Goddess, from River Road Recipes IV, is a wonderful recipe to make for your guests or to bring to share during the Lenten Season. It is sure to be a crowd pleaser. Crabmeat Green Goddess, RRR IV, p. 59. Photo by Meghan Poole. Beat the cream cheese and butter in a mixing bowl until blended, scraping the bowl occasionally. Stir in 1 tablespoon mayonnaise, green onions, 2 crushed garlic cloves, salt, black pepper, red pepper, Tabasco sauce, and lemon juice to taste. Spread the cream cheese mixture 1/2 inch thick on a serving tray. Chill, covered in the refrigerator. Combine 1 cup mayonnaise, sour cream, parsley, 2 tablespoons lemon juice, and 1 crushed garlic clove in a bowl and mix well. Season with salt, black pepper, red pepper, and Tabasco sauce. Spread the crab meat mixture over the cream cheese mixture just before serving. Garnish as desired and serve with assorted party crackers.